"Quinoa has a light, fluffy texture when cooked, and can be used as an alternative to white rice or couscous in most dishes. 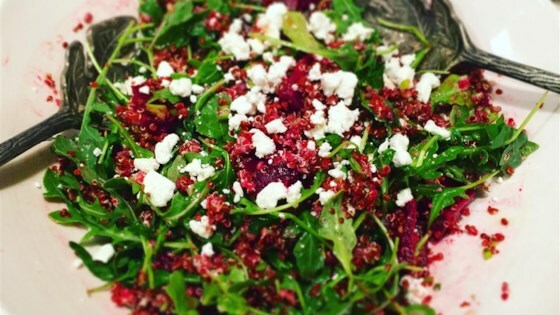 The arugula has a rich peppery taste, and has an exceptionally strong flavor for a leafy green which goes well with the slightly nutty flavor of the quinoa." Place a steamer insert into a saucepan, and fill with water to just below the bottom of the steamer. Cover pan and bring the water to a boil. Add beets, cover pan, and steam until just tender, 7 to 10 minutes. Set aside. Bring quinoa and 2 cups water a saucepan over high heat. Reduce the heat to medium-low, cover, and simmer until the quinoa is tender and the liquid has been absorbed, about 15 minutes. While the quinoa is cooking, whisk olive oil, red wine vinegar, sugar, garlic, salt, and black pepper together in a large bowl. Remove quinoa from heat, then immediately add half of the vinegar dressing while fluffing the quinoa with a fork; reserve remaining dressing. Cover and refrigerate quinoa until cool, at least 1 hour. Stir green onions, arugula, goat cheese, beets, and remaining dressing into cooled quinoa mixture. Toss lightly before serving. I LOVE this salad! I used regular quinoa and omitted the sugar. I'll be making this regularly. Colorful, tasty salad! I ran out of quinoa, so used mostly millet. I omitted the salt, and changed the arugula to spinach. We didn't need the cheese! I'll be making this again soon! The photograph doesn't do this salad justice!! This salad is wonderful!!! Can't wait to make it again.